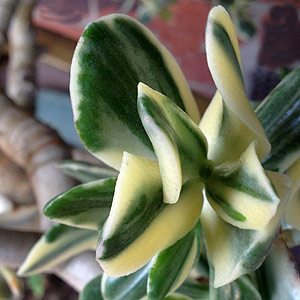 If you are looking for a variegated Jade plant then maybe try Crassula ovata variegata also known as Crassula argenta variegata. The leave are rounded a deep but bright green with creamy variegation. An excellent plant in a container where over time it will form a small branched shrub to around .7m in height. These are a slower growing plant than other species so you will need to be a little patient. Plants for sale in nurseries are often grown in part or filtered shade so be a little careful if you are placing them in full sun, as they can suffer from leaf burn. Crassula ovata variegata is a hardy plant growing well in full sun to part shade. A well drained potting mix is essential as is a frost free position. When watering wait until the soil mix has become nearly dry and then give the plant a good soaking, allow to dry again before watering. Cut back watering during winter months. How fast will the variegated jade plant grow ? A lot slower than the green leafed variety, it may take 5 – 8 years to reach .7m in good conditions, so mature specimens are not cheap. As with all jade plants, Crassula ovata variegata can be pinched out to help it form more branches and a bushier habit. Frost damage – usually black leaves and sever die back, Jade plants do not like frosts.